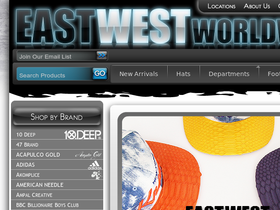 Check out EastWest Worldwide, online at EastWestWorldwide.com. EastWest has always strived to provide their loyal customer base with the best in footwear, streetwear, and lifestyle brands. With top brands including G-Shock, Plain Jane, Reebok, Rocksmith, Stussy, Timberland, Vans, and more, you're sure to find what you're looking for. With a wide selection of apparel for both men and women, you can always stay at the top of fashion. Save on your purchase with the best EastWest Worldwide discounts, EastWest Worldwide coupon codes, and EastWest Worldwide promotions from RetailSteal.com. EastWest Worldwide is now offering free shipping on orders of $50+. They will accept returns for your unworn item(s) within 30 days of the original shipment date. See site for full shipping and returns details. Click our link to hurry over to EastWest Worldwide today and enter our coupon code at checkout to save 15% on your purchase of $100 or more. Use this coupon code online at EastWestWorldwide.com and enjoy a 10% discount on your purchase of $50 or more. Shop online at EastWestWorldwide and save 10% off any purchase with this promo code. Act now and take advantage of free shipping on your US order with this promo code from EastWest Worldwide. Enjoy free shipping from EastWest Worldwide. Shop now and use coupon code with purchases $30+. Enjoy $8 international shipping on all purchases of $100 or more made online at EastWest Worldwide. Enter our coupon code to save now. Check out the sale section at EastWest Worldwide and you'll find a huge selection of apparel and accessories up to 75% off. At EastWest Worldwide, pay only $5 for select t-shirts. Click to shop. At EastWest Worldwide, buy select sneakers for as low as $20. Click link to purchase. At EastWest Worldwide, save up to 63% on select Timberland Boots. Click link to buy.